With 25 years of hindsight, Jurassic Park marks a pivotal point in the history of visual effects in film. It came 11 years after 1982’s Star Trek II: The Wrath of Khan debuted computer-generated imagery for a visual effect with a particle system developed by George Lucas’s Industrial Light and Magic to animate a demonstration of a life-creating technology called Genesis. And Tron, also in 1982, included 15 minutes of fully computer-generated imagery, including the notable light cycle race sequence. 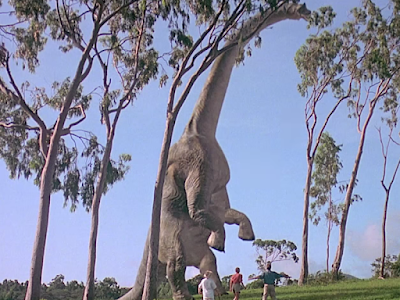 Yet Jurassic Park stands out historically because it was the first time computer-generated graphics, and even characters, shared the screen with human actors, drawing the audience into the illusion that the dinosaurs’ world was real.